Generously butter one side of each tortilla. Top the right half of each tortilla with 1/3 cup shredded cheese, 12-15 slices Sugardale pepperoni, a sprinkle of Italian seasoning, and 1 Tbsp. each of the chopped red and green peppers. Then gently fold the tortilla in half to form a semi-circle. In a large non-stick skillet, cook quesadillas over medium heat until warm throughout and cheese is melted, about 5-8 minutes. 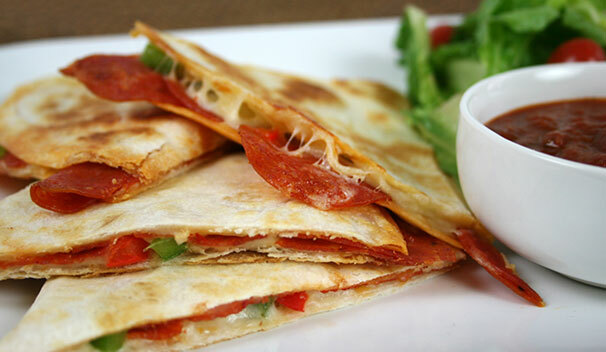 Flip each quesadilla over halfway through cooking. Allow to cool slightly, then slice into wedges. Serve with pizza sauce on the side for dipping.